Windows XP (codenamed Whistler) is an operating system developed by Microsoft, released on 2001-10-25. It is the sixth operating system in the Windows NT operating system line, succeeding Windows 2000 and preceding Windows Vista. It also succeeded Windows ME after the end of the Windows 9x kernel. It is one of Microsoft's longest lasting operating systems, with almost 13 years of support (both mainstream and extended) and still runs on less than 5% of desktop and laptop computers worldwide as of 2019-04. 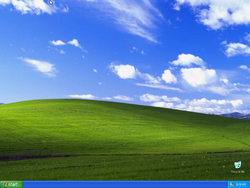 Windows XP got a major UI overhaul during development, with the introduction of Themes. Users could change the way windows and buttons looked with the new visual style, Luna. It had three color schemes, which were based on blue, green and silver. Users could still select the Windows Classic theme from previous versions of Windows (98, 2000, ME, ...), and customize the preset Windows Classic color schemes. The introduction of ClearType, an anti-aliasing font function allowed easier text reading on desktop computers with LCD-TFT monitors and laptops, but also had an effect on CRT monitors. The taskbar is locked by default for new user accounts, to prevent accidental resizing or moving of the taskbar and/or the toolbars. Multiple instances of an application are grouped automatically and inactive tray area icons are hidden automatically, to prevent cluttering of the taskbar. Starter: This version was intended for emerging markets, and was introduced in 2004, meant for low-cost PCs. It cannot launch more than 3 programs at a time and will not see more than 512MB of RAM. Home Edition: This edition is for low to mid end PCs and can address up to 4 GB RAM. This version was also included in ULPCs, and was sold along with Professional. Professional: This is the mainstream high-end version, sold along with the Home Edition. 64-Bit Edition: This was a special edition for Itanium-based computers. There were two releases, first of which was based on Windows XP and the second of which was based on Windows Server 2003. Professional x64 Edition: This was the x64 version based on Windows Server 2003. Media Center Edition: This version is especially for Media Center-based PCs, and is not sold normally. System requirements are significantly higher than other editions. This version includes Media Center and new themes and Microsoft Plus! features such as Royale. Embedded: This version is intended for the embedded sector. Tablet PC Edition: This version was included in tablet computers from 2002-2006. This is the tablet-optimized version of Windows XP. N, K and KN Editions: The N version was made for the European markets and did not include Windows Media Player; the K version was made for the Korean markets and included two shortcuts to Korean websites by default because the government insisted.